FEMA’s Strategic Plan is created every four year and outlines a clear roadmap for building a stronger, dynamic, and innovative New FEMA that fulfills our vision of becoming the Nation’s Preeminent Emergency Management and Preparedness Agency. The 2014-2018 FEMA Strategic Plan reflects objectives the Agency will accomplish to provide the best possible support to the American people before, during, and after disasters. It sets forth the strategies FEMA will employ to accomplish the objectives and also establishes measurable outcomes to achieve. This Strategic Plan was developed through the involvement of hundreds of FEMA employees and many external stakeholders who contributed to generating our objectives, strategies, and outcomes, and who are now working to execute this Plan. 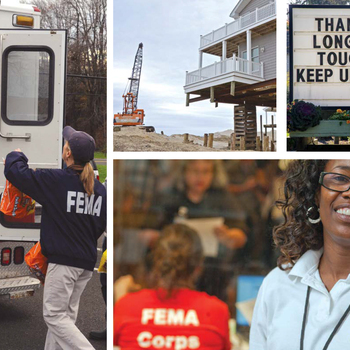 FEMA is just one part of the Nation’s emergency management team. The Agency will be successful only by building, sustaining, and drawing upon the capabilities of the whole community. The support and engagement of partners throughout Federal, state, and local governments; tribal governments; the private sector; faith-based and non-profit communities; and citizens across our country will ensure our collective success in bringing about the outcomes set forth in this Plan.